Our award-winning tours are of the highest standard, offering exceptional quality, professionally-led by our full-time local expert guides in your chosen area of interest, whilst creating the most authentic tour that is ethicall-organised to benefit locals and the environment. By booking with Ashanti African Tours on any of the wide selection of tours that we offer, you can rest assured that your holiday will directly benefit locals and their environment. Ashanti African Tours pay their staff far above the minimum wage, pay pension contributions, provide healthcare and are establishing a company profit-share scheme to benefit all staff. In addition to this, we are leaders in ethical travel, putting the local communities and environment at the heart of what we do. 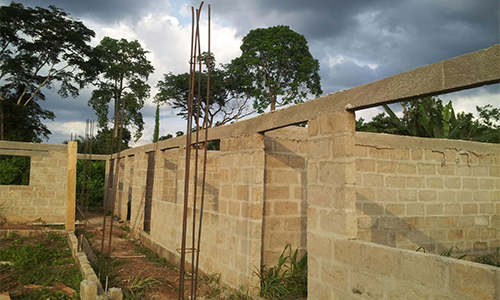 Through our ethical travel initiatives, we have been able to build an eight-classroom school facility catering for Crèche, Kindergarten and Primary school students in a coastal village in the Central Region of Ghana. 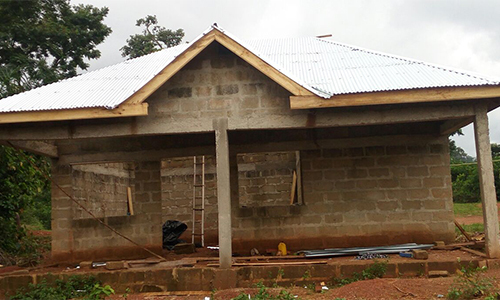 We are also currently in the advanced stages of building an eleven-classroom school for three remote communities in the Ashanti Region of Ghana, as they currently do not have school facilities close to them. 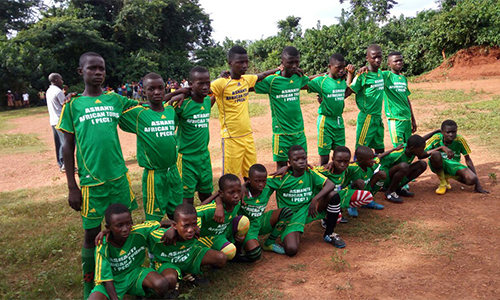 In addition, we are sponsoring 23 community-based committee members to patrol a portion of endangered Upper Guinea Rainforest habitat, stopping illegal logging and hunting activities. We are actively involved in protecting endangered and vulnerable bird and mammal species within Ghana. Our professional and ethically-run operations employ locals, we source the vast majority of our products and services locally and we are passionate about giving our tour participants the ultimate authentic Ghana experience. 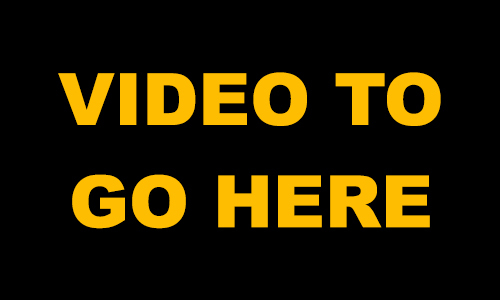 Many travel companies state they are into responsible travel, however this is often greenwashing to get responsible travellers to book with them. This is not the case at Ashanti African Tours and we are happy to forward more detailed information on all of our community development and environmental conservation projects, feel free to ask. How better to see a destination and learn about their ecosystems, cultures, traditions and history, than traveling with a local and professional guide. You don’t just get to visit and experience all the major tourist sites and nature, you also get off-the-beaten-track to experience the country through the eyes of a local. Seeing daily life as it really is and creating authentic cultural connections in a safe and exciting environment is all part of the experience. Allow our expert team to design a private tailored itinerary for you around your areas of interest, maximising your enjoyment during your time on holiday. Alternatively, we can direct you to one of our small group tours. The more information you can provide us, the better we can design that perfect holiday experience for you. If you want to travel for 3 weeks, 3 days, or a year, it is no problem, just contact us and we will do the rest. Many of the most amazing destinations to travel to for the ultimate scenic, wildlife, cultural and historical experiences are also some of the most under-threat habitats, where vulnerable poor communities live. Traveling with us gives you the opportunity to make a real difference to the people, communities and ecosystems we experience, by actively benefiting locals and their businesses; providing sustainable incomes and protecting their culture, heritage, wildlife and habitat through eco-tourism and ethical travel. This type of responsible travel also offers our participants a much more authentic experience when traveling with us. When traveling to Ghana, it is important to book with a local tour company which has the legally-required insurance policies and operating licences, as your international travel insurance will be invalid if they haven’t. Ghana is an emerging economy and the resources are not available to check and identify the many bogus travel companies which have developed websites and operate illegally here. The cheapest option is not always the best option, as there are reasons for companies offering cheaper packages and these are usually due to them not operating within the laws of the land. It is estimated that over half of local tour operators here in Ghana do not have professional indemnity and public liability insurance; use vehicles that are not comprehensively insured; do not have a Ghana Tourism Authority operating license and as they are not registered, do not pay taxes which ultimately has a negative effect on Ghana’s development. 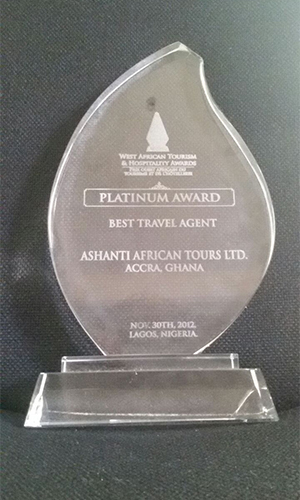 Rest assured that when booking with Ashanti African Tours, you are booking with a professional, legitimate company, operating with all the necessary insurance policies, licenses and registrations. 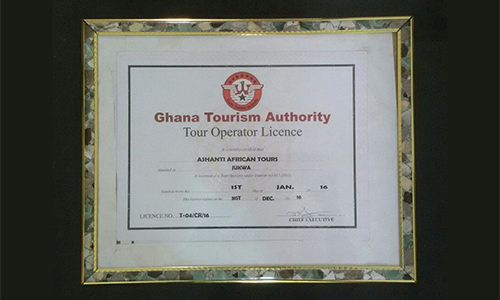 Our Ghana Tourism Authority operating license number is T-04/CR/16; our company has public liability and professional indemnity insurance with a policy cover of $1,000,000.00 per claim; all our vehicles are comprehensively insured and all our guides are registered and certificated to guide tourists. All of the above are legal requirements to accept international and domestic tourists here in Ghana. We are honoured to have been recognised on several occasions for the high standard, quality, professionally-organised holidays we offer. 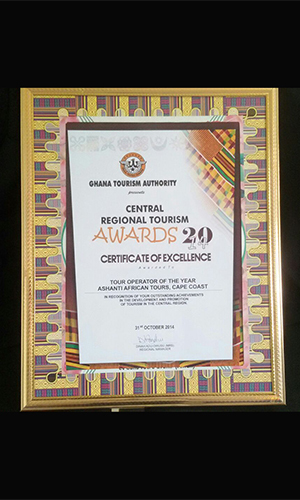 Our Ghana Tour Operator of the Year, West African Tour Operator of the Year 2012, and most recently 2016, awards should give our potential tour participants an indication of the quality tours we offer. How does choosing one of our tours help locally at the destination? Our small-scale low-impact responsible approach to tourism has a positive sustainable effect on the local communities we visit in several ways. 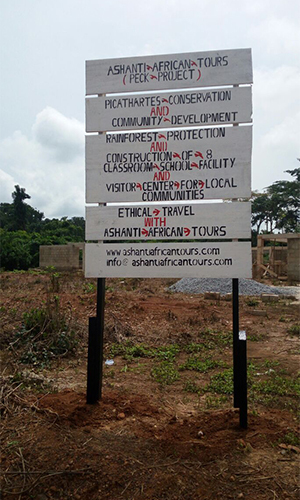 The main aim of Ashanti African Tours is not only to provide our tour participants with the perfect holiday of a lifetime, but to also contribute to the alleviation of poverty in the areas we visit, in addition to having a positive effect on conserving the environment, culture and heritage of these vulnerable locations. These are wide-ranging, from the direct employment of local guides, drivers and restaurant workers, to hotel employees and local shopkeepers. Giving locals the opportunity to earn and improve their income through tourism employment enables them to have more money to put back in the local economy in a sustainable way. As we are focused on using locally owned hotels, guesthouses, homestays, restaurants and retail outlets which source their goods and services locally, this also has a positive knock-on effect within agriculture, food production and the retail industry among other services. The vast majority of exotic locations with rich cultures and diverse wildlife waiting to be discovered are in some of the poorest countries in the world. Ethical tourism can have a positive sustainable impact on the development of these locations for the benefit of the people living there. Money coming into the local communities, enabling more taxes to be paid, ultimately increases the funding available to improve and develop more schools, hospitals, roads and other areas vital to the improvement of the daily lives of its people. Preservation of culture, heritage and traditions is a major benefit of responsible tourism which also gives locals a sense of pride in their history when showcasing and teaching travellers about the diversity of their communities. It ensures they hand down the knowledge and tools to future generations, using tourism to highlight the importance of protecting and continuing traditions which have been around for centuries. As the global population increases, there is exceptional pressure on the natural resources of the world, with the poorest countries being the most vulnerable to the large revenues on offer from the mining and timber companies wanting to exploit them. Ethical tourism can play an important part in protecting vulnerable habitat essential for our ecosystem and the future of our planet. Through responsible tourism we can create sustainable and effective economic incentives to conserve the natural habitat of our planet for future generations.